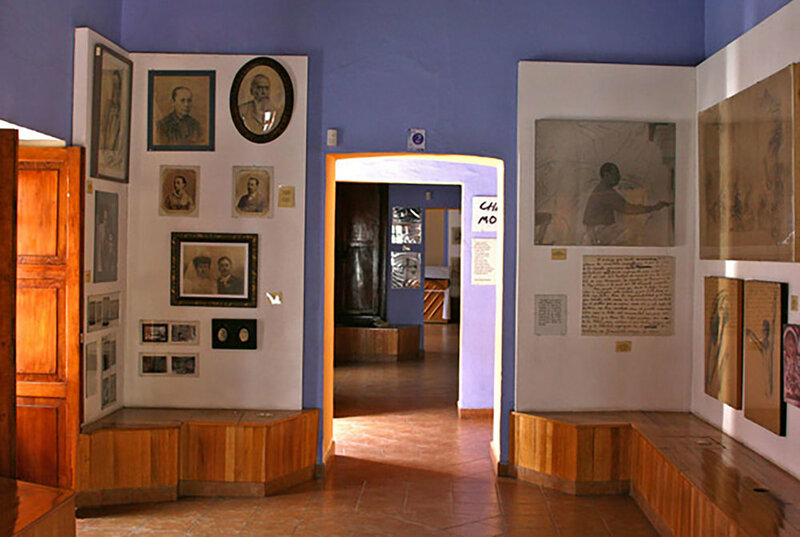 The birthplace of Diego Rivera in Guanajuato is today a museum, a recreation of his home. The fountain in the yard. 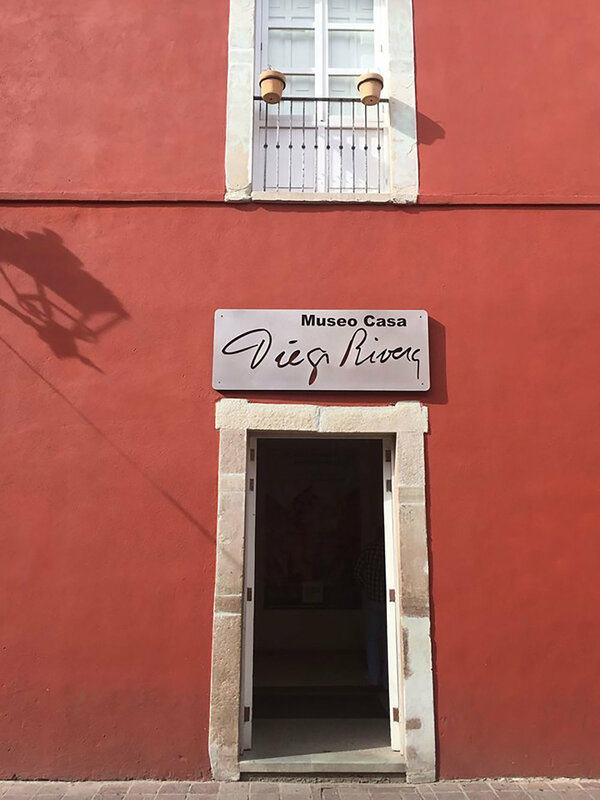 It is fitting that the home and birthplace of Guanajuato's most famous son has been converted into a museum. Diego was born here and lived here until the family moved to Mexico City six years later. Guanajuato, north of Mexico City, is the mining city of 'silver barons' and the most colourful city in Mexico. 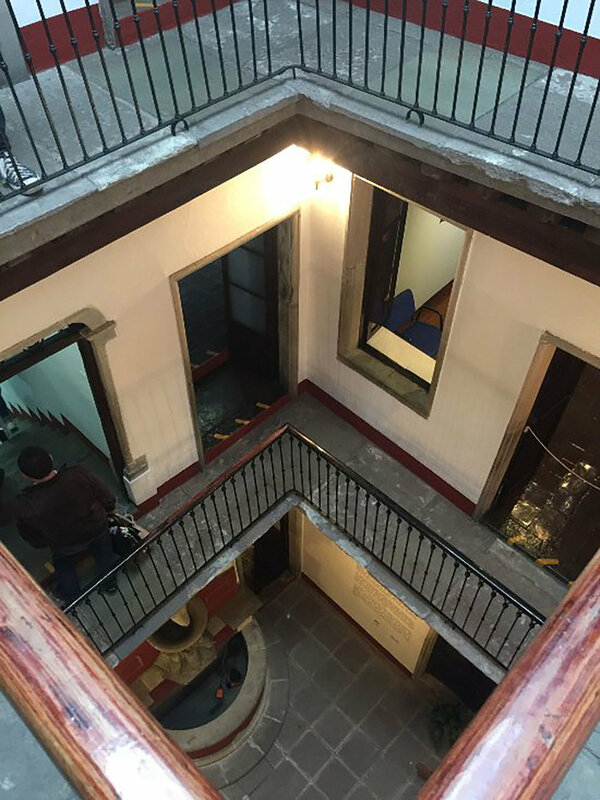 Museo y Casa de Diego Rivera is partially his childhood house and partially a gallery. I came here with my husband in December 2014. At the time of our visit, the first level was the home with the furnishings and family photos. The second level displayed Diego's early works, saved by his mother. 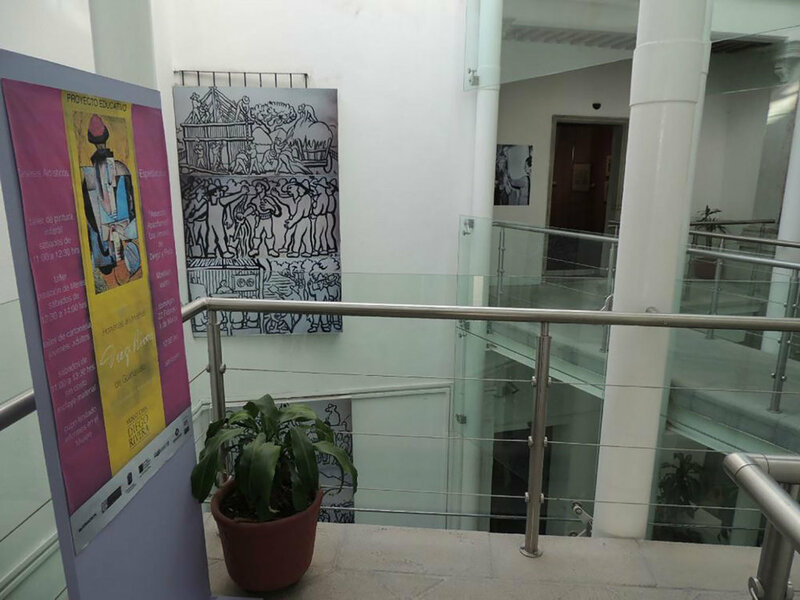 If you are Diego fan, the most interesting exhibition is on the third floor, where the works of his teachers and mentors are displayed so you can see how they influenced his art and see his artistic journey. Diego was born into a well-to-do family. He was the son of María del Pilar Barrientos and Diego Rivera Acosta. Diego had a twin brother named Carlos, who died two years after they were born. He came from a line of European ancestors. His paternal grandfather, Don Anastasio de Rivera, an officer of the Spanish army, lived in Spain, but was born in Russia. He was the son of an Italian mercenary who had also served in the Spanish military. The grandfather decided at some point to emigrate to Mexico. He bought a mine in Guanajuato but the mine was flooded and he was financially ruined. At the age of 50 he married a 17-year old Mexican girl called Inés and they had nine children. The eldest was Diego's father. At the age of 65 he joined the army of Benito Juárez to fight the French occupants and died in the war. Dining room (furniture is from the 19th century, not original). His father also joined this war (at the age of 13). Once he returned to Guanajuato, he became a school teacher and then an inspector of rural schools for the state of Guanajuato. He was a freemason and a liberal activist. He married María del Pilar Barrientos when she was 15. Diego's mother nearly died at the birth of the twins. She was depressed by her later loss of one of the twins and the family insisted that she studied. She worked afterwards in the field of obstetrics. At the age of two, Diego was weak and was sent with his Tarascan Indian nurse Antonia to her mountain village to be nursed. He always remembered her as a healer and a magician. Throughout his life he maintained that he loved Antonia more than his mother who complained that he became a 'little Indian'. No wonder his art was always on the side of the indigenous people and his murals depicted social inequalities. Diego's statue at the museum. While his mother was Catholic, he embraced his father's liberal and anticlerical beliefs. He learnt to read at the age of four, when he returned to Guanajuato, and he started to draw at the age of three. He loved mechanical devices and got the nickname 'el ingeniero'. His father often took him to the railroad depot to observe trains. By the time he was six, his father protested in favour of oppressed minorities and peasants, gaining enemies among the government officials. His mother was scared of increasing hostility, sold all the family belongings and the family moved to Mexico City. That is where Diego found his fame. So what is this house like? It is tall and narrow, and it has a central courtyard and a fountain that gives it air and charm. Its first floor rooms feature furnishings of that era, including the brass bed Diego was born in. But what I loved most about the house is the modern remodelling. Glass panels in the adjacent house to three floors make the staircase really full of light. In my view, it gives the house a new look, making it more interesting (but then, I love modernism). The house is much bigger than you would expect from the outside. You will need to reserve an hour (or more if you are Diego fan). Diego with his twin brother (1 year old): pinterest.de. I always think it is interesting to know the formative years of an artist, to better understand his roots. The museum's ground floor is a recreation of the family home, furnished with 19th-century antiques. The furniture is not original; it was donated to the museum to recreate the living standards of the middle classes at the turn of the last century. The house has a small central courtyard, which allowed all floors to keep cool during the hot summer months. It was a popular style in Mexico at the time. During our visit there were a couple of actors dressed as Frida and Diego, walking around and we could have asked any questions (our Spanish was not so strong then, though). It gave an extra flavour to the classical set-up. 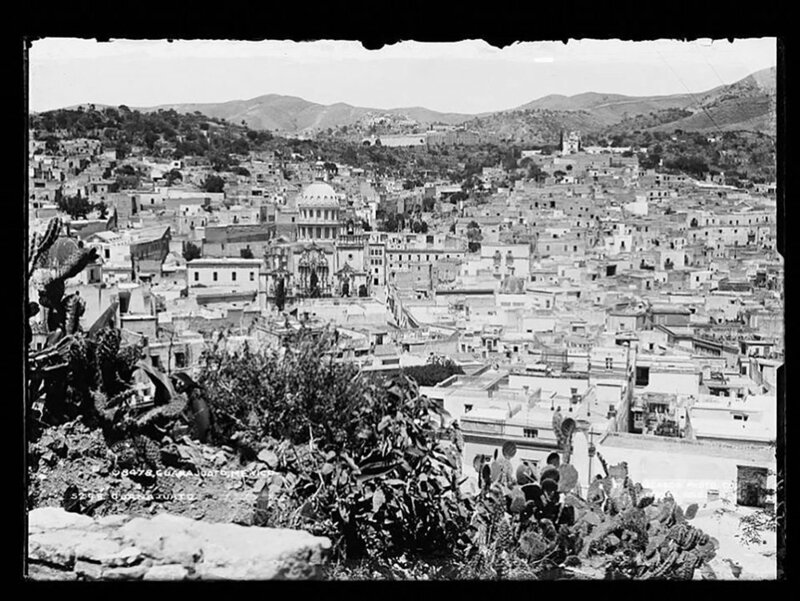 The city in 1890 by W.H. Jackson: cazadordementes.tumblr.com. It is certainly worth going to the galleries on the second and third floors. But don't expect Diego's large-scale murals that he is famous for. Those are on display in different places. This house displays some of his lesser paintings and shows different creative stages in his formative years and his cubist period: portraits, landscapes, nudes (one of Frida Kahlo), allegories, still life paintings and mural sketches are some of the pieces in the house. There is a lovely view of the city from the roof; don't miss it. Diego and Frida, A Smile in the Middle of the Way: iphf.org. View of the city from the rooftop. If you are in downtown Guanajuato, you can easily walk there. The museum is in street Positos, the house number is 47. It is closed on Mondays. No photos are allowed inside so I had to borrow some from the internet. The entrance fee is only 25 pesos. There is a fun bar across the street, with a lovely courtyard. We had Mexican snacks there, followed by drinks in a nearby little square, of which there are an abundance in Guanajuato. At Plaza de San Fernando with my husband Rhod, just down the hill from the museum. You are likely to spend the whole day (minimum) in Guanajuato. Do not miss the evening entertainment of estudiantinas, minstrels who will take you for a walk along the old alleys of the city, while singing.